• For quantitative determination of histamine in food, beverage and agricultural products. • Fast and sensitive. Use of 20 μL sample. Linear detection range 0.0025 - 1 mM (0.3 - 111 ppm) histamine in 96-well plate assay. • Convenient. The procedure involves adding a single working reagent, and reading the absorbance after 30 minutes. Room temperature assay. No 37°C heater is needed. • HISTAMINE (C5H9N3) is a biogenic amine naturally present in many foods and body cells in amounts without toxicological significance. It is also a contaminant that mostly found in the Scombridae family fishes such as tuna and mackerel or other seafood products when improperly handled or stored. The consumption of foods containing high level of histamine may lead to an allergy-like food poisoning known as scombroid poisoning. BioAssay Systems histamine assay kit is based on histamine dehydrogenase catalyzed oxidation of histamine in which the formed electron mediator reduces a formazan (MTT) reagent. The intensity of product color, measured at 565 nm is directly proportional to histamine concentration in the sample. 1. Does the assay kit work in particular species? Our assays work in all species. None of our kits are species specific. 2. Do you offer free sample kits or discounts for testing? Unfortunately, at this time we do not offer free sample kits. Customers must purchase assay kits for their own testing, on occasion we will offer discounts. 3. 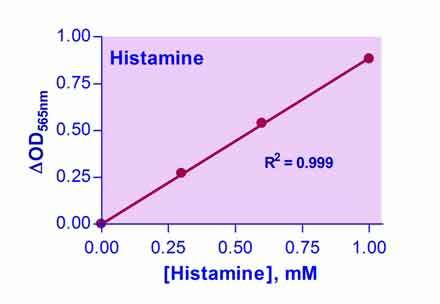 Does the histamine kit suitable for biological samples such as blood, urine, etc.? Since most of the biological samples contain histamine under the kit detection limit, this kit is only suitable for food, beverage, and agricultural products. Fish or other solid samples: Weigh ˜1 g sample and grind to paste. Weigh ˜200mg paste sample and homogenize in 800 μL 0.05% acetic acid. May vortex or use handheld homogenzier to homogenize sample. If using blender to homogenize sample, just simply scale up the sample size and solvent in 1mg: 4 μL ratio (ex: 5 g samples in 20 mL acid). Centrifuge homogenate at 14,000 g for 10 min. Transfer the clear supernatant into a clean tube. It is prudent to run a pilot test of the sample at different dilutions. Choose a dilution with the readings in the detection range of the standard curve for further assays. Most samples can be stored at -80°C if not assayed immediately. Cheese: Weigh ˜200 mg sample and homogenzie in 800 μL 0.05% acetic acid. Heat in heat bath at 60°C for 10mins. Centrifuge homogenate at 14,000 g for 10 min. Transfer the clear supernatant into a clean tube. Yes, it is highly recommended to run for each assay a standard curve, or where applicable, internal standard.